If you are looking for information on the Long John Silvers franchise business opportunity, Long John Silvers seafood franchises or Long John Silvers seafood restaurant franchising, then you have come to the right place. 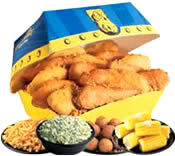 Long John Silver's® is America's largest quick-service seafood chain with more than 1,200 units worldwide. The first Long John Silver's Fish 'n' Chips opened in 1969 in response to growing consumer demand for quick-service seafood. This new approach gained overwhelming acceptance and has led to bold modern restaurants and a menu that meets the taste of today's consumers. As the concept has grown, Long John Silver's menu has likewise evolved. Today, we offer a menu that meets the desire of consumers looking for more variety and great taste. Our exciting array of flavor profiles and taste sensations includes a variety of signature batter-dipped fish, chicken, and seafood; breaded fish; a signature sandwich line; salads and desserts. Our promise, to provide each guest great tasting, reasonably priced fish, chicken and seafood in a fast and friendly manner on every visit ensures Long John Silver's position in American Culture. In May 2002 Long John Silver's became a part of YUM! Brands Inc, the world's largest restaurant company in terms of system units with nearly 32,500 in more than 100 countries and territories. Yum! Brands also owns A&W All-American Food Restaurants, KFC, Pizza Hut and Taco Bell restaurants. This is your opportunity to invest in Long John Silver's and Yum! Brands and experience the power of big, category-leading brands! We believe there has never been a more exciting time to be a part of Yum! Brands and Long John Silver's! When we created Yum! Brands, we had the privilege of possessing a heritage of success established by the founders of KFC, Pizza Hut, Taco Bell, Long John Silver's, and A&W. Their leadership and innovation helped launch the quick service restaurant industry. The brands they created enjoy worldwide recognition and popularity. Yum! Brands is the biggest restaurant company in the world, and we are the worldwide leader in our product categories! Do You Have What It Takes? Commitment. Capital. Capability. Do you have capital to grow? Do you have a passion for operations? Are you committed to building people capability? Yum! Brand, the leader in Multibranding, is looking for energetic new franchisees to share in our purpose and passion for Customer Mania by putting a Yum! on customers' faces around the world. You can leverage our foodservice and Multibranding experience to capitalize on market development opportunities. Yum! believes Multibranding is the key to the future of the QSR business. Owning more than one brand allows you to "eliminate the veto vote" and give your consumers a "WOW" experience. Research shows that consumers prefer Multibrand restaurants six to one over single brands. What Do You Get With Over 50 Years of Franchising? Proven support from Yum! & Long John Silver's - You become part of an organization with tremendous franchise support including advertising, business coaching, training, development and cooperative sourcing. We strive to work as "one system" because it's the best way to meet our customer's needs. You invest in us. We invest in you. Advertising & Marketing - Yum! is committed to making Long John Silver's even bigger. Last year alone, Yum! and its franchisees spent more than $600 million in consumer advertising. National marketing news is communicated regularly throughout the year. Many markets have local advertising cooperatives to coordinate local marketing activity. Franchisees are encouraged, but not required, to participate in system promotions. Franchise Recruiters - Yum! Franchise Recruiters will help you through the new franchise approval process - from qualification to discovery day, to site identification and registration. Franchise Specialists will explain how to qualify as a Yum! Brands franchisee. Coaching - Long John Silver's has Franchise Business Coaches (FBCs) and/or Franchise Business Leaders (FBLs) to provide business insight and instruction as you operate your Long John Silver's. As you move into steady-state operations, your FBC or FBL will keep you abreast of important business initiatives, organize key regional training activity, and be your primary point of contact. Training - Yum! requires that each franchisee complete Management Team Training prior to the opening of their Long John Silver's. Single brands require six to eight weeks training for key restaurant personnel. Multibrand training depends on your level of previous quick-service restaurant (QSR) experience. Yum! University - Yum! University is the training and development arm of Yum! Brands, Inc. Its primary mission is to provide global support for the education and institutionalization of key Yum! leadership programs for both company leaders and franchisees. Unified Foodservice Purchasing Co-op, LLC (UFPC) - UFPC provides supply chain management services exclusively for all corporate and most franchise-owned A&W® All-American Food, KFC®, Long John Silver's®, Pizza Hut® and Taco Bell® outlets in the United States. Since March 1999 UFPC has saved Yum! more than $539.6 million by negotiating costs, making volume purchase commitments and assuming other procurement functions and risks that reduce suppliers' costs.
. . . a Yum! Brands franchise is a once-in-a-lifetime opportunity!